Many Subscription Options Are Available! Please call 617-423-2462 to order a subscription and learn about our discounts for bulk orders. We are also able to customize our cover for client gifts. 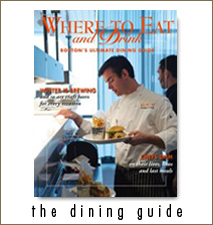 Where to Eat is currently for sale at over 1400 locations in 300 towns and 20 states. Here are just some of the locations where you will find us around Massachusetts and on the web. Also check out our featured stores by clicking on this link! John Dewar & Co. Inc.